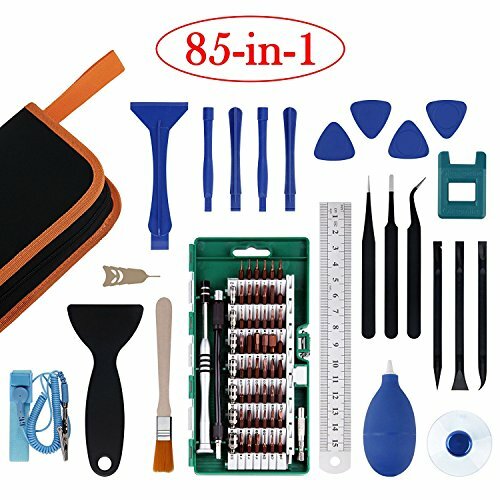 ✔Multi-Magnetic Screwdriver Set-85 in 1 precision screwdriver bit sethave more tools, which includes Premium LCD Suction Cup, art knife, Anti-Static tweezers, Anti-Static Wrist Strap, SIM card ejector pin and, Triangle plectrum, plastic spurge, Magnetizing and demagnetizing tool, etc. ✔High Quality & Perfect Perform-These durable electronics repair tool Kits are made of S2 tool steel, whose hardness can reach to HRC 58-62, much more durable than CRV - Steel. The non-slip driver in the market is machined from a single piece of aluminum. ✔Flexible Shaft & Adjustable Extension Bar-Make you can reach some blind angle screws which are not on the surface. It\'s very suitable for you to repair your electronics. ✔Premium Durable Portable Bag-Professional portable hardware tools with perfect weight & compact design for easy carry. The bag is made of durable PU leather will be carried everywhere easily and fashionable. ✔Super Compatibility -This updated advanced screwdriver set includes new bits (\"Y size 0.8\" and \"Main board size 1.5\") for repairing popular iPad, iPhone, PC, Watches, Glasses, Laptops, Phones, Game Consoles, and other electronics.